During the winter season, our bodies endure a substantial amount of stress. As temperatures drop, our immune systems can suffer. But staying happy and healthy throughout the cold and flu season is easier than you think. Here are 5 food groups that will help you boost your immune system and fight disease all winter long. It’s easy to assume that important chemical compounds are complex. However, some of the most remarkable substances are composed of simple repeating units. Here are four carbon-based structures that, while simple in their underlying composition, have revolutionized the chemical material industry. When most scientists make mistakes, it generally leads to pulling of hair and gnashing of teeth. However, some rare investigators get lucky. For instance, the the development of polyethylene consisted of a series of fortuitous mistakes. In 1894, Hans von Peckmann produced the first credited batch of polyethylene as an unintentional chemical byproduct. It was rediscovered four decades later by Eric Fawcett and Reginald Gibson when systemic oxygen impurities induced its polymerization. Karl Ziegler later discovered a modern catalyst widely used for the synthesis of polyethylene when nickel leached from the stainless steel surfaces used for a separate chemical reaction. At first glance, polyethylene looks like nothing special, largely consisting of a chain of polymerized methylene (-CH2-) units. However, its great advantages stem from its low cost and ability to be readily modified into a variety of forms with different chemical properties. Today, it is an integral part of the trillion dollar plastics industry, with applications ranging from food packaging to electrical insulation. Move over, Slick Rick. Replacing the hydrogen atoms of the polyethylene backbone with fluorine atoms leads to polytetrafluoroethylene, one of the slickest materials known to man. More commonly known as Teflon, its origin is attributed to another accidental discovery. While Roy Plunkett was attempting to produce Freon gases for refrigeration, a waxy substance spontaneously formed instead. Further characterization of this material revealed several interesting chemical properties, including high melting points and extraordinary slipperiness. The extremely low friction properties of Teflon have led to the Guinness Book of World Records describing Teflon as “equivalent to wet ice on wet ice.” While it’s perhaps most well-known for its use in non-stick cooking pans, its applications vary from interior linings for airplanes, spacecraft, and the first atomic bomb to aerodynamic coatings for race cars. 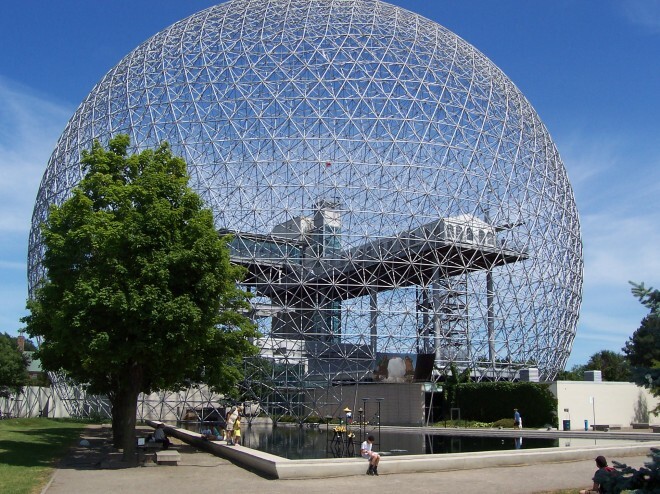 Image of Buckminster Fuller’s spherical structure in Montreal that inspired discovery of fullerene’s structure. Scientists often display an insatiable desire to name new structures after themselves or other scientific pioneers. In rare cases, this tendency can transcend disciplines. WhileWhen attempting to recreate carbon-containing structures found in space, a team lead by Harry Kroto created a molecule composed purely of sixty carbon atoms. However, its exact structure remained puzzling. While brainstorming possible structures, Collaborator collaborator Richard Smalley recalled spherical structures designed by architect Buckminster Fuller while brainstorming possible structures. Using this as inspiration, Smalley (with paper, scissors, and limitless patience) was able to reproduce a similar configuration that fit the proposed chemical formula of the discovered compound. This structure, which consists of carbon atoms arranged in a repetitive hexagonal lattice, was subsequently named ‘fullerene’ (also nicknamed ‘buckyballs’). While fullerenes themselves have a variety of biomedical and industrial uses, they have largely been surpassed by related cylindrical structures called carbon nanotubes. Developed in 1991 by Sumio IIjima, carbon nanotubes have been widely used for targeted drug delivery, solar cells, electronics, and several other applications. Interestingly, carbon nanotubes are considered a potential replacement for the long entrenched silicon-based technology that drives the computer industry. Everyone is well acquainted with graphite, most recognized for its use as a non-toxic replacement for lead in pencils. However, graphite acquires unusual properties when it is reduced from bulk material to a single layer of carbon, also known as graphene. 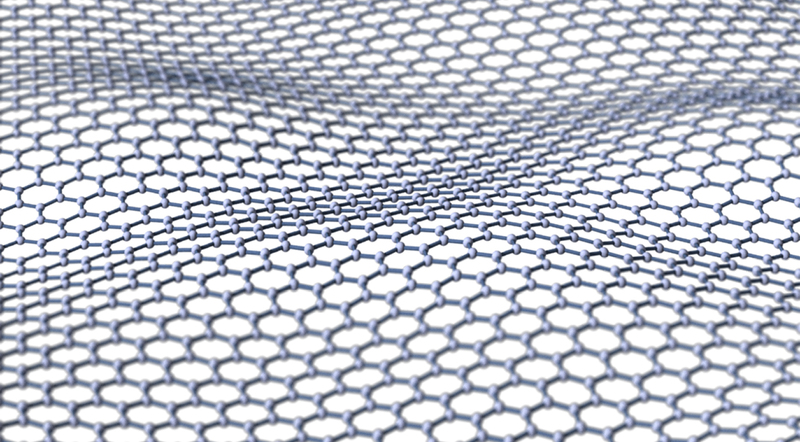 While long proposed as a theoretical structure, graphene was not isolated until 2004. In a project that could only be described as a graduate student’s worst nightmare, Andre Geim and Konstantin Novoselov produced graphene by peeling single layers off of graphite using scotch tape. Mercifully, an explosion of research following this discovery has led to easier and more reproducible methods for manufacturing graphene. 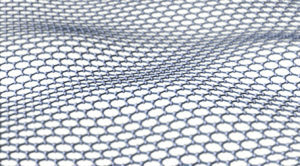 Image for structure of graphene. While the structure of graphene is essentially that of an unraveled fullerene or carbon nanotube, it has many unique physical characteristics, including high electrical and thermal conductivity, flexibility, and ridiculous strength (it is considered one of the strongest materials ever created). As a result, the potential applications for graphene evoke thoughts of a utopian future, including ultrafast electronics and flexible supermaterials. While these applications will take time to be fully realized, the future for graphene looks exceedingly bright. Chemical materials composed of relatively simple backbones can have astonishing macroscopic properties. Simple modifications, like the replacement of individual atoms or the raveling and unraveling of different structures, can lead to vastly different chemical and physical characteristics. This tunability forges a wide open future for the field of material chemistry and its impact on everyday consumers alike. Women are largely underrepresented in STEM fields (science, technology, engineering, and mathematics). To tackle this problem, groups around the University of North Carolina’s campus, throughout the Research Triangle, and across the country have dedicated themselves to the advancement of women in STEM. Women In Science and Engineering (WISE). Women in Science (WinS). Graduate Women In Science (GWIS). These groups all want to fix the leaky pipeline, develop future leaders, encourage the next generation, and strive for work-life balance. Yet, despite being a woman in science myself, I did not always identify with this cause. As an undergraduate, I regularly received emails eagerly inviting me to participate in events hosted by the Society of Women Engineers (SWE). One week, a prominent female scientist would be invited for a seminar; the next, the group would host a networking dinner. However, even with the lure of free food, I never attended. I did not understand why we needed a group dedicated solely to promoting women in STEM. No one had ever told me that I couldn’t do math because I was a girl, and I had never felt outnumbered in my science classes by my male peers. Also, the name of the group made it sound exclusive: The Society of Women Engineers. It felt like a treehouse with a big, “No Boys Allowed Sign” at the entrance. By promoting one group, were we excluding another? While it is important for these groups to provide a safe and supportive environment for women to express their concerns, in order to address the gender disparities in STEM, men need to be part of the conversation as well. Yet, for every women in science related event I have attended here at UNC, male attendance remains low. So I ask the reader, how can we counteract the notion that these events are exclusively for women? Are men interested in these events but fearful of saying something wrong? In the shadow of Nobel laureate Tim Hunt’s comments about his “trouble with girls”, and the subsequent demise of his career, it is probably not hard for men to imagine that the women in science are sharpening their pitchforks for the next ill-placed comment. If this is the case, how can we create a space where women and men will speak freely? Only through open communication can we identify the problems that allow gender inequality to persist and move toward a permanent solution. A couple of years ago, I read what was easily the best work of nonfiction that I had ever read. As I am an avid consumer of nonfiction books and documentaries, that statement alone should speak for itself. Within a few pages of reading Siddhartha Mukherjee’s The Emperor of All Maladies: A Biography of Cancer, I was hooked. As a student interested in cancer research, I was already deeply entrenched in the subject matter, but Dr. Mukherjee’s graceful prose, his attention to both the historical and modern implications of cancer, and his treatment of the patients, physicians, researchers, and activists waging battle against this ancient scourge were absolutely riveting. As the subtitle suggests, the book is an odd kind of biography, the “biography of cancer,” tracing both its natural history and the intertwined biographies of the men and women attempting to conquer it from ancient times to the present day. I was thrilled to learn this spring that the renowned documentarian Ken Burns would be producing a film directed by Barak Goodman based on the book for PBS. The documentary,Cancer: The Emperor of All Maladies, brings the book to life, putting faces to names and giving patients a chance to tell their chapter in the biography of cancer in their own words. To anyone interested in cancer or whose life or that of a loved one has been touched by cancer (which is to say, everyone), I highly recommend reading the book and watching the documentary. The film is available to stream through PBS and Netflix.